Darwin's finches—where did they actually come from? In 1835, Charles Darwin visited the Galapagos Islands and discovered a group of birds that would shape his groundbreaking theory of natural selection. Darwin's Finches are now well-known as a textbook example of animal evolution. But just where did a species synonymous with the discovery of evolution come from? A new study from The Auk: Ornithological Advances presents some of the best models to date on where these birds actually originated. San Diego State University's Erik Funk and Kevin Burns set out to determine the ancestral biogeography - how a species' distribution varies over space and time - of Coerebinae. Coerebinae is a subfamily of birds called tanagers. This group includes the famous Darwin's Finches and their fourteen closest relatives. Using state-of-the-art statistical software, Funk and Burns modeled two competing hypotheses. Both hypothesis models contained the same geographic area of the Galapagos, South America, and the Caribbean, but one model divided this area into more subregions than the other. The subregions were based on areas that shared similar plants and animals, such as the the Amazon or the Andes. When eight subregions were included in the model, the results indicated that the Caribbean, not the closer South American mainland, was more likely to be the origin of this bird group. However, the opposing model contains only five regions and indicates that the South American mainland is as likely as the Caribbean to be the home to Darwin's Finches' ancestors. The authors conclude that the current data suggest both potential origin sites are equally likely. Funk says, "the results...were a bit surprising, because they suggested a dispersal pattern that was not necessarily the most 'straightforward' explanation for how these birds arrived in the Galápagos. I think one of the big take-away messages here is the possibility that biogeographic events, like dispersal, may not necessarily happen like logic tells us they should. 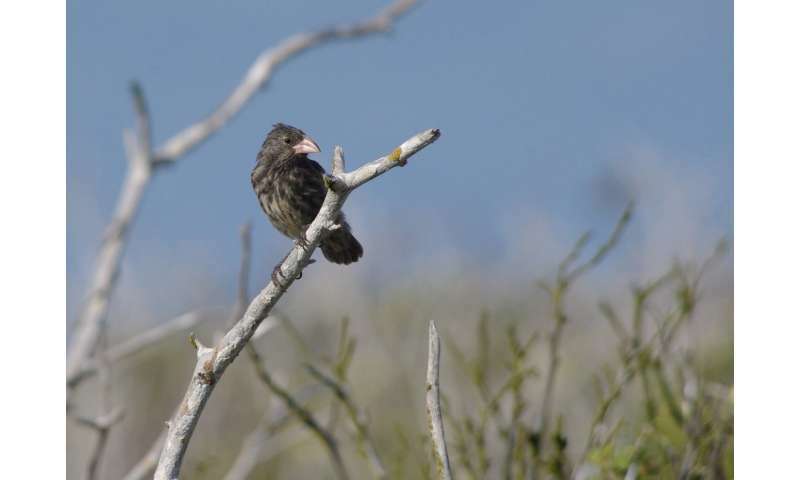 Darwin's finches are such a highly studied group, and it is often taken for granted they arrived from mainland South America, but hopefully our results show readers that there is no more support for this hypothesis than there is for a Caribbean origin." Funk and Burns suggested the successful colonization of the Galapagos Islands was a result of two traits. First, the finches' ancestors were more likely to wander than other species and consequently encountered islands more often. Second, these ancestors had a large amount of genetic variation in bill size and shape. This diversity in bill morphology allowed them to establish themselves and exploit their newfound niche. Better understanding the biogeography of Darwin's Finches allows scientists to learn how animals move, and how this affects their subsequent evolution and ability to adapt to new or changing environments. "In 2018, we still have fundamental things to learn about one of the most studied and celebrated groups of birds, Darwin's Finches. Perhaps we should be calling them Darwin's Tanagers because it is Burns' tree of life for these birds, nesting them firmly in Tanagers, that is enabling new insights into the evolution, morphology, and origins of this remarkable group of birds. Funk and Burns use new biogeographic techniques in conjunction with recent phylogenies to explore the origins of Darwin's Finches," adds Shannon Hackett, Associate Curator in the Department of Zoology, and Head of the Field Museum's Bird Division at the Field Museum, who is an avian diversity and phylogeny expert who was not involved in the research. I am wondering if DNA testing would confirm these findings?